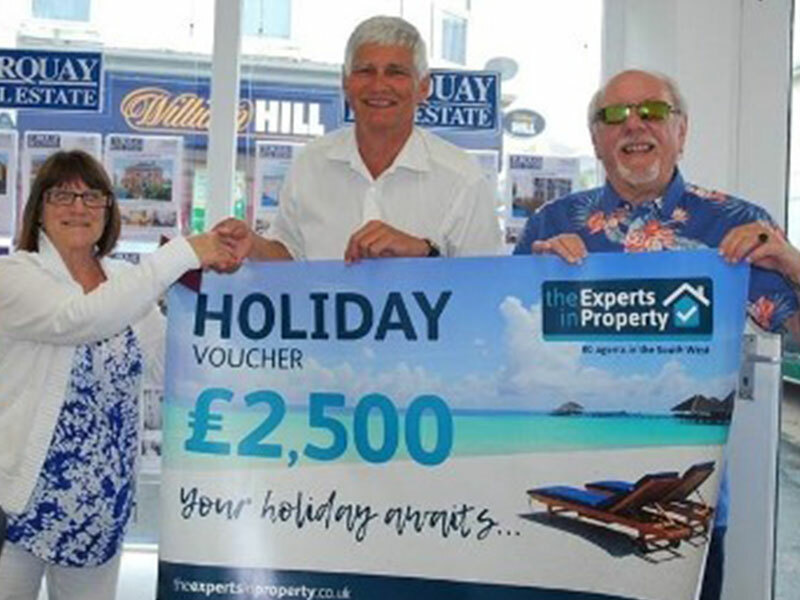 A couple from Torquay are thrilled to have been presented with a holiday voucher worth £2,500 as the winners of the Experts in Property’s Spring Giveaway. John Lawton, director of Torquay Real Estate, a long-standing member of the estate agency network, last week handed over the vouchers to Lesley and Ray Newnham. The couple can use the vouchers towards a holiday of a lifetime or perhaps a cruise, to pay for a number of short city breaks, or anything in between. The Spring Giveaway promotion began in February. Homeowners who had their local agent of the Experts in Property round to conduct a valuation till the end of April were entered with a chance of winning the prize. Torquay Real Estate sold the Newnham’s last property back in 1999, when they bought their current home – a flat in Babbacombe’s Lyme View Road, which enjoys fantastic views along the South Devon coastline and across Lyme Bay with Portland Bill visible on a clear day. In February, the couple Invited John to their flat to discuss its value as well as the pros and cons of extending the original 99-year lease by a further 90 years. The Newnham’s valuation was one of the first to qualify for this Spring’s campaign, and one of around 70 valuations Torquay Real Estate undertook during the promotional period. Many of these instructed the agency to sell their property but some, like the Newnham’s, are still considering their options and may well ask John, or his brother Mike, back again in the future for further advice. When John telephoned Mrs Newnham to let the couple know about their win, she thought he was joking! the Experts in Property is a network of independent, local estate agencies based across the Westcountry, from St Ives to Bournemouth and Bristol, all working together to reach more buyers and sell more homes. For further information, to find your local office or to browse property for sale throughout the region, visit www.theexpertsinproperty.co.uk, or get in touch with Torquay Real Estate – pop into the office at 79 Babbacombe Road in Torquay, call 01803 327287 or visit www.torquayrealestate.com.